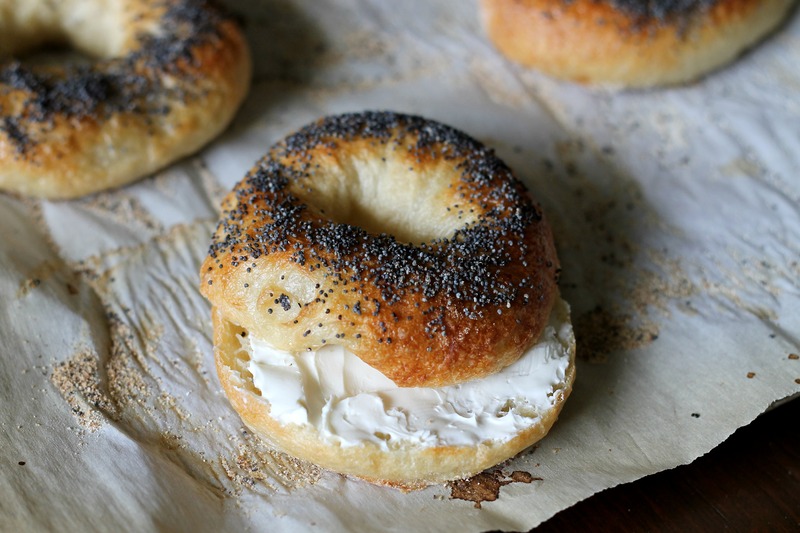 We don’t know of any person out there who doesn’t like a good bagel! They are chewy, flavorful, and suitable for nearly any topping. We usually get them from a local place, or Manhattan Bagels (an east coast chain that sells surprisingly delicious bagels). Bagels are one food that we have been planning to make for ages but have never gotten around to actually making them. They are absolutely not hard to make at all, and we are glad to have finally done it! As usual, our King Arthur Flour Baker’s Companion cookbook has not disappointed. The frozen kind and the store-bought kind that come in a bag cannot compare to the homemade variety of bagels. While they are wimpy and more the texture of bread, these have lots of texture- nice and chewy, just like bagels should be. The poppy seeds on top add a bit of crunch, although you can omit them or add a different topping of your choice such as sesame seeds or dried onion. 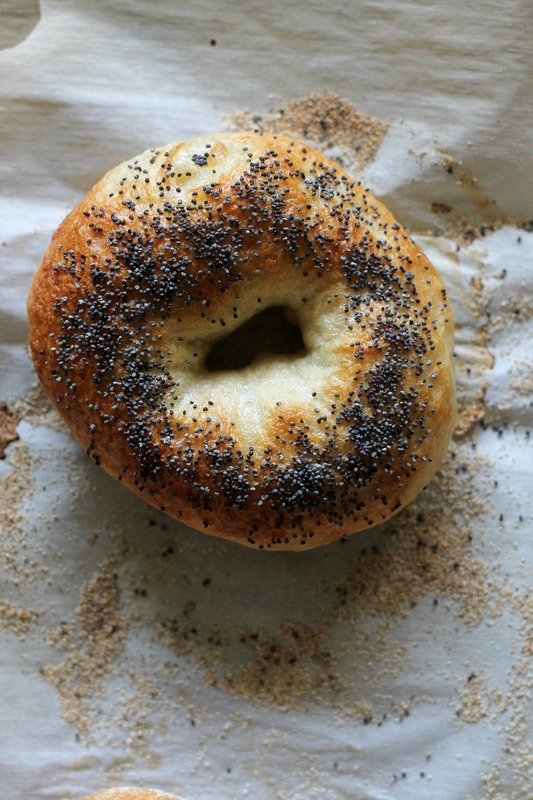 Many bagel recipes require time in the fridge, although these do not. You’ll have bagels in under three hours! This recipe makes 8 bagels, just the right amount for our family. Each bagel is about 210 calories, which is not bad at all! We always use low-fat cream cheese to cut down the calories too. P.S. We are working on the shaping of these. We got one really nice round one but the rest were a little uneven. Hopefully the next time we make these they will be a little rounder! Combine all the dough ingredients in the bowl of a stand mixer fitted with the dough hook and knead on medium-low speed for 10 minutes. Place the dough in a lightly greased bowl and cover it with plastic wrap. Set aside to rise in a warm place until puffy, 1 to 1 1/2 hours. Transfer the dough to a work surface and divide into eight pieces. Working with one piece at a time, roll it into a smooth, round ball. Cover the balls with plastic wrap and all them to rest for 30 minutes. While the dough rests, heat the water, malt powder or substitute, and sugar to a gently boil in a large, wide-diameter pan. Preheat the oven to 425 degrees Fahrenheit. Line a large baking sheet with parchment paper and sprinkle well with cornmeal. Use your index finger to poke a hole through the center of each ball of dough, then twirl the dough on your finger to stretch the hole to 2 inches in diameter. Repeat with the remaining pieces of dough. Transfer the bagels, 3-4 at a time, to the simmering water. Bring the water back up to a boil if necessary. Cook the bagels for 2 minutes, flip them, and cook for 1 minute more. Using a slotted spoon or strainer, remove the bagels from the water and place them on the prepared baking sheet. Repeat with the remaining bagels. Combine the egg and water in a bowl. 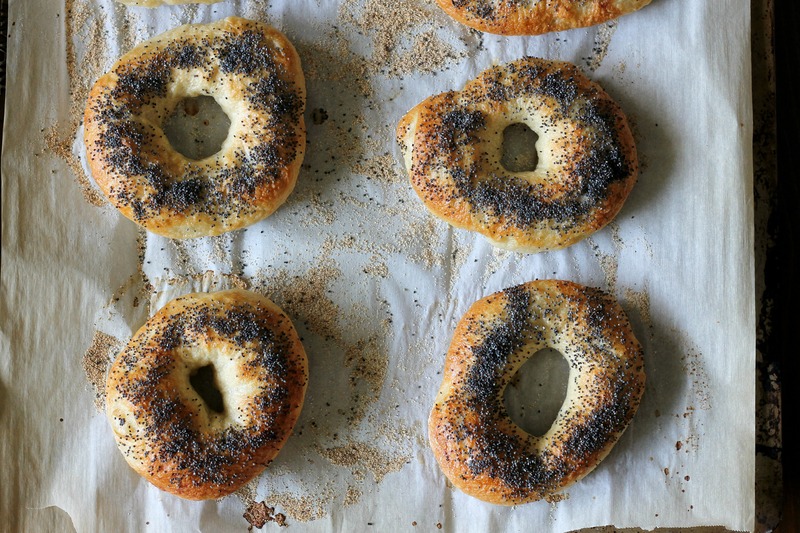 Brush each boiled bagel with the egg wash using a pastry brush and sprinkle with poppy seeds. Bake the bagels for 20-25 minutes until they are as brown as desired. Remove them from the oven and let them cool on a wire rack. Serve as desired with cream cheese or any other topping you would like. Enjoy!